9.40.040 Administrative authority and responsibility. 9.40.050 Revocable license agreement required. 9.40.060 License types, application, and process. 9.40.070 Land Development Code applicability. 9.40.080 Commercial, B-1, CBD districts. The purpose of this chapter is to manage the use of public rights-of-way in a manner that is flexible, adaptable, and protects the community’s health, safety and welfare. (Ord. 4-2016 § 2). “Accessway” means that portion of the public sidewalk section designated as the clear and continuous pedestrian corridor for use and enjoyment by the general public. “Barrier” means any fence, landscaped planter, rope or other perimeter enclosures used to separate cafe sidewalk seating areas from the public accessway or required curb clearance established within the public rights-of-way. “License” means a revocable license agreement, addressing the terms for using a portion of the public rights-of-way for private purposes. “Licensee” means any property owner, business owner, representative, or assignee that is the signatory to a valid revocable license agreement and who is responsible for the maintenance, upkeep and general conformance of the standards established by this chapter. “Merchandise display” means stands, tables, freestanding merchandise or other features intended for sale to the general public that is placed within the public rights-of-way. For the purposes of administering this chapter, sandwich board signs shall be considered a merchandise display. “Permanent physical feature” means trees, public signage, street lights, fire hydrants, decks, and porch roofs extending into the rights-of-way and any other features deemed by the city manager to be a permanent feature. (Ord. 4-2016 § 2). This chapter applies to all public rights-of-way within the city of Gunnison incorporated limits. Any private roads and sidewalks serving development within the city limits are not affected by the standards established herein, but private ways intended for the purposes of public use shall be subject to Section 4.1 (Adequate Public Facilities), Section 4.2 (Road Construction Standards), Section 4.5 (Pedestrian Circulation Facilities) and any other applicable standards established by the city of Gunnison Land Development Code. Nothing in this chapter shall be construed to limit the city’s ability to use public rights-of-way as deemed necessary or desired. (Ord. 4-2016 § 2). The city manager, or a designee assigned by the city manager, shall have the administrative authority over the provisions of this chapter. (Ord. 4-2016 § 2). All use of public rights-of-way for private purposes requires a revocable license agreement (license) approved by the city of Gunnison. Exceptions: Placing irrigation pumps, irrigation pump covers, mail boxes and landscaping improvements compliant with the Land Development Code (Section 4.6, Landscaping, Buffering and Screening) and parking of currently licensed private vehicles within the rights-of-way pursuant to Chapter 5.20 GMC (Traffic) shall not be subject to licensing requirements established in this chapter. (Ord. 4-2016 § 2). 1. Permanent Feature License Agreement. Revocable license agreement applications requesting the placement of apparatus, facilities, posts, any structural element of a building extending into the right-of-way or other permanent physical features shall be subject to review and approval of a revocable license agreement acted on by the city council at a regular or special meeting. Applications proposing cafe sidewalk seating shall be classified as a permanent feature license agreement. 2. Administrative Use License Agreement. A revocable license agreement application proposing the placement of merchandise, displays, racks, sandwich boards or other features that are temporary in nature are subject to administrative approval by the city manager under the provisions of this chapter. B. Interpretation Authority. The city manager shall have the discretionary authority to determine if a license application is classified as a permanent feature or an administrative use license agreement. The city manager may submit any administrative use license agreement application to the city council for consideration. 1. Name, Street and Mailing Address, Telephone Number, and Power of Attorney. The proposed licensee name, address and telephone number. If the licensee is to be represented by an agent, a letter signed by the licensee granting power of attorney to the agent shall be submitted, authorizing the agent to represent the licensee and stating the representative’s name, street and mailing address and phone number. 2. Legal Description. The legal description and street address, if such exists, of the property on which the improvement is to be located. Legal descriptions are available at the county assessor office (970-641-1085) or city community development department (970-641-8150). 3. Disclosure of Ownership. A disclosure of ownership of the property to which the application applies. 4. Vicinity Map. An eight and one-half inch by 11-inch vicinity map locating the subject property within the city of Gunnison. 5. Written Description. A written description of the proposal and an explanation in written, graphic or model form of how the proposed private use of the public right-of-way complies with the applicable review standards established in this chapter. 6. Plan View and Elevation Drawing. Any license application proposing to develop a permanent feature within public rights-of-way shall provide a scaled plan view (map) and elevation drawing depicting the feature, the continuous and clear accessway, and any other permanent feature located on the sidewalk adjacent to the business front. 7. Barriers. All applications proposing barriers shall include cut sheets or design illustrations depicting the proposal design. D. Process. Five stages comprise the process for the use of public rights-of-way for private purposes as described below. 1. Pre-Application Conference. The licensee is encouraged but not required to meet with the community development department staff prior to the submittal of a revocable license agreement application. 2. Application Submittal. The licensee must provide a complete application to the community development department prior to scheduling a formal review. 3. Staff Review. The community development director or an assigned designee shall review the application within five working days of the application submittal. Upon review completion, the community development department shall notify the applicant of any omissions or required additional information. 4. Decision. All permanent physical feature license applications shall be submitted to and discussed by the city council at a work session, prior to scheduling any action at a regular meeting. Administrative use license agreement shall be approved by the city manager or designee. 5. Post-Decision Actions. All uses of public rights-of-way for purposes that are subject to license application review shall be memorialized through the execution of a revocable license agreement defining the terms by which the licensee shall comply. E. Insurance and Indemnification. The revocable license agreement shall be a binding contract approved as to form by the city attorney. The licensee/property owner hereby agrees to indemnify, defend, and save harmless the city, its officers, agents, and employees against any and all claims for personal injury or property damage, including reasonable attorney’s fees arising out of or connected in any way with the licensee’s use of the public right-of-way. The licensee shall obtain and maintain in force comprehensive general liability, broad form property damage and blanket contractual liability insurance in a combined single limit amount, per claim and aggregate, of at least $1,000,000 covering the licensee’s operation on the sidewalk. Such insurance shall name the city as an additional insured. F. Application Fee. The application fee for a license agreement shall be determined by resolution approved by the city council. G. Termination. Upon termination of the license, the licensee shall immediately remove any permanent features, personal property, furnishings, display and equipment from the right-of-way. The public right-of-way shall be restored to its original condition. (Ord. 4-2016 § 2). A. Sidewalk Facilities. Pedestrian circulation facility improvements associated with either a land use development application or a site development application shall be subject to the pedestrian circulation facilities standards established in Section 4.5 of the city of Gunnison Land Development Code. B. Landscaping. Landscaping improvements associated with either a land use development application or a site development application shall be subject to the standards established in Section 4.5 (Landscaping, Buffers and Screening) of the city of Gunnison Land Development Code. C. Signage. All signs and banners in the public rights-of-way shall be subject to Section 4.8.H of the city of Gunnison Land Development Code, which includes the requirement to maintain a current and valid administrative license agreement. (Ord. 4-2016 § 2). Uses within the commercial, B-1, and CBD districts proposing to use public rights-of-way for private purposes shall be subject to the standards established herein. 1. Accessway. All public sidewalks shall maintain a minimum six feet wide clear and continuous pedestrian corridor. The accessway shall, in most cases, be located between the property line and any irrigation ditch located within the right-of-way. No clear and continuous accessway shall be located within the curb clearance area. To accommodate easy pedestrian movement, horizontal transitions of the accessway should be uniform and should not exceed three feet over a linear distance of eight feet. 2. Curb Clearance. Proposed uses on public sidewalks shall be arranged and conducted in a manner to maintain a minimum three feet of clear distance from the curb edge. Placement of permanent features, merchandise displays or other items shall not create a physical impediment greater than 15 feet in length that precludes pedestrian movement between parking stalls and the accessway. 3. Americans with Disabilities Act Standards. Any proposed use of public rights-of-way for private purposes shall fully comply with all provisions of the Americans with Disabilities Act (ADA). 4. Vertical Clearance. Any proposed use of public rights-of-way for private purposes shall maintain a minimum seven feet of vertical clearance distance from the sidewalk grade. 5. Sound System Noise Level. The maximum noise level for any sound system equipped with speakers within the public rights-of-way shall not exceed 60 decibels. 6. Electric Cords or Other Tripping Hazard. The use of electric cords or other features not specifically addressed herein, but that could create a tripping hazard, are prohibited. 1. Merchandise displays located on public sidewalks shall be contained in no more than two display clusters per business frontage. 2. 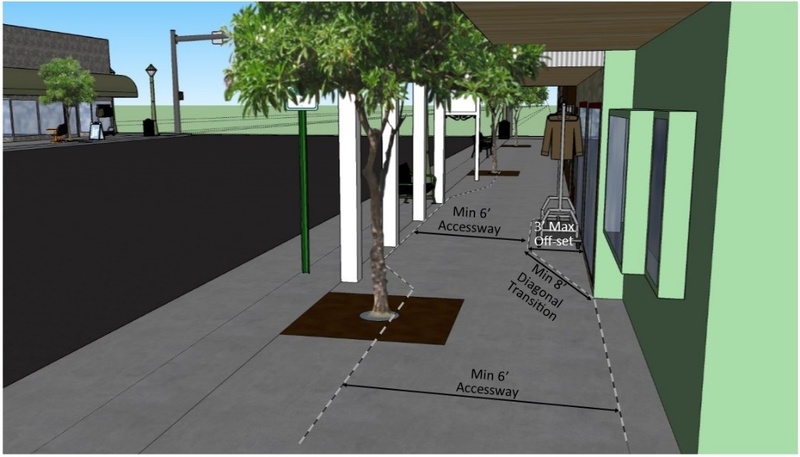 The aggregate maximum coverage area of displays shall be 35 square feet of the sidewalk surface area directly adjacent to the business store front. For the purposes of administering this chapter, the display of sandwich boards shall be considered a merchandise display, and signage standards established by the city of Gunnison Land Development Code (Section 4.8) shall apply. 3. Alternative merchandise display configurations may be considered if subsection (A) of this section, General Standards, is satisfied. 4. Merchandise displays shall be removed from the public rights-of-way after business hours. 5. Placement of merchandise displays shall not create a dangerous public condition and shall provide adequate means for emergency egress and ingress from any adjacent building. 1. Sidewalk cafe seating shall be arranged in a manner that complies with all provisions of subsection (A) of this section, General Standards. 2. Sidewalk cafe seating shall be licensed for use between March 15th and November 15th. The licensee may be required to discontinue sidewalk cafe seating at any time as determined and ordered by the city manager. 3. 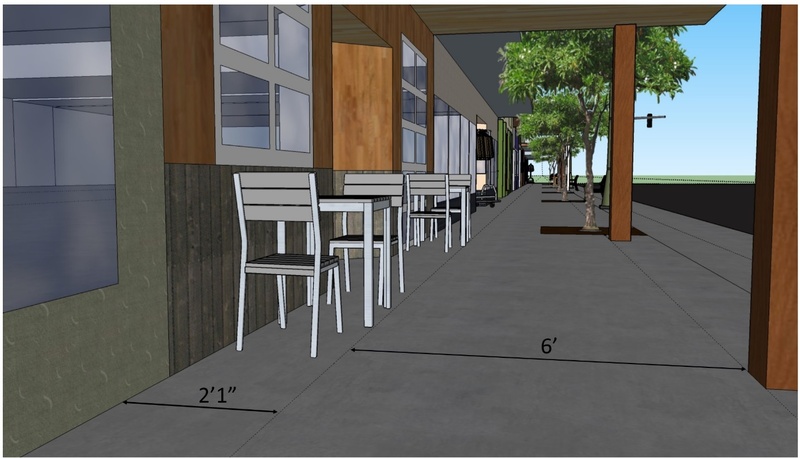 Sidewalk cafe seating shall be located directly adjacent to the business wall-plane or property line. Alternative seating layout may be considered if subsection (A) of this section, General Standards, is satisfied. 4. Sidewalk cafe seating may extend onto an adjacent business only upon written agreement by the adjacent property owner and under the condition that insurance indemnification provisions protecting the city’s interest are satisfied. 5. Tables, chairs and other features associated with sidewalk cafe seating shall not interfere with the pedestrian accessway or the curb clearance area. Chairs next to the pedestrian accessway shall be placed in a manner as not to impede upon the accessway. 6. Smoking in the cafe seating area is prohibited. 7. Sidewalk cafe seating associated with a business serving alcoholic beverages shall be limited to the specified premises established by a current Colorado state and city liquor license. The specified premises shall abut directly to the building wall-plane/property line bordering the licensee’s business. 8. Sidewalk cafe seating associated with a business serving alcoholic beverages shall have a barrier bordering the liquor license’s established premises. Pursuant to state regulations, the serving of alcohol shall be conducted within defined barrier. Sidewalk cafe seating businesses not serving alcohol are not required to but may install a barrier. a. General. The location, design and construction of all barriers is subject to review and approval by the city council. b. Design Concept. 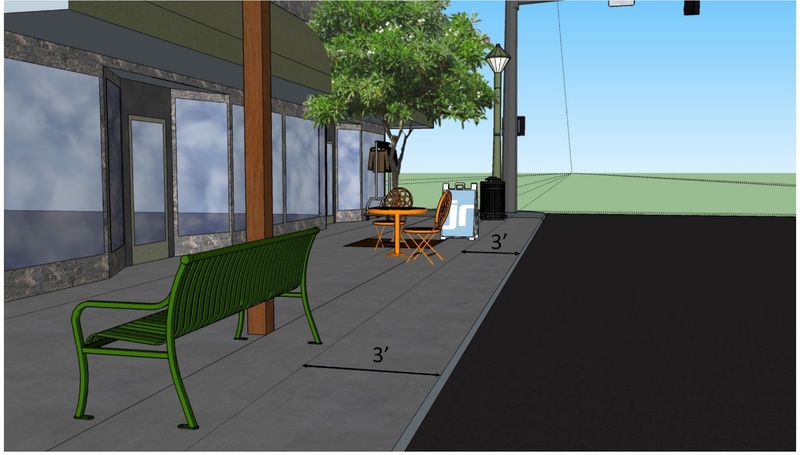 The physical design of the barrier shall be compatible with the design of the building, shall be visually appealing and help to separate the dining/seating area from the sidewalk. c. Open Appearance. Barriers shall be at least 70 percent open (transparent) in order to maintain visibility of street level activity. d. Height. Barriers shall be a minimum height of 36 inches and may not exceed 42 inches in height. e. Anchoring. Barriers may be anchored through the use of recessed sleeves and posts or weighted bases, or other means approved by the city. When removed, the resulting surface must be flush with the sidewalk. f. Support Members. Stanchions or other vertical supporting members that have a base shall not create a tripping hazard. The stanchion base shall not be domed or more than one-half inch above the sidewalk surface. The stanchion bases shall not impede upon accessway. g. Use of Planters. Planters may be used in situations where no barrier is required. All planters must have living plants contained within them. Dead plants must be replaced or the planter removed from public view. h. Prohibited Materials. Fabric inserts of any size, chain-link, cyclone fencing, standard wire gage material or similar small soft metal materials are prohibited from being used as part of the barrier. a. The licensee shall ensure that tables, chairs and other materials do not interfere with pedestrian movement in the accessway. b. Umbrellas placed within the public rights-of-way shall not display trademarks, logos, brands or other advertising messages. c. Furniture and features must be maintained in good visual repair. d. All furniture and features must be durable and of sufficiently sturdy construction as not to blow over with normal winds. e. Furniture and features must not be secured to trees, lampposts, street signs, hydrants or any other public street infrastructure by any means during restaurant operation hours or when the business is closed. 11. Lighting. Lighting will be required for outdoor dining areas where food will be eaten during evening hours. Lighting features shall be decorative and complement the architectural character of the building facade. Lighting features will illuminate only the sidewalk area and shall not cause direct glare or other visual obstruction to pedestrians or vehicle drivers. 12. Maintenance. The licensee shall keep the outdoor dining area clear from litter, food scraps, and soiled dishes and utensils at all times. Debris generated from the business shall not be disposed in public trash receptacles located in the public rights-of-way. Private trash receptacles shall be emptied daily. The licensee is required to keep the entire sidewalk in and around the sidewalk seating area clean and orderly. No debris shall be swept, washed or blown into the sidewalk, irrigation ditches, gutter or street. (Ord. 4-2016 § 2). Reserved. (Ord. 4-2016 § 2).